I'm lucky enough to be going on holiday this half term to Spain. Going away in the autumn half term is always the best time to go because a, it's freezing in England and b, all the summer clothes are on sale. Lets just say, I've done quite a bit of shopping recently. However, going abroad does mean travelling which of course means being tired and looking awful. I was going through products to take with me and I narrowed it down to my top 7 travel makeup products. These are my favourite products to help revitalise my skin on the plane and on land! I'm very fussy with mascara because, I hate clumpy, obvious mascara. I like my makeup to be subtle and natural and this mascara is perfect for that. It isn't waterproof however, it does fare well in water. Vaseline is my go to product. I love it. You can use it on eyelashes, eyebrows, dry skin and of course dry lips My lips are always dry no matter the weather, so on planes they are unbearable. I love this Vaseline to wear on my lips because of the pink tint. This perfume was my mums but she gave it to me! This perfume took a while for me to like because it's very distinctive. My mum compared it to the smell of marijuana because it's such a powerful smell! Despite that, I love it. It's perfect for long journeys because it lasts a really long time. This lipstick is another of my go to lip products. It matches my natural lip colour perfectly so it's brilliant at covering my dry lips and of course, it smells divine. It took the longest time for me to like this product. Again, it has a very distinctive smell. When I heard it was almond and milk, I was expecting a creamy, vanilla scent, however it smells almost sour. I got it in a Burt's Bees kit for my birthday and I was determined to like it. Now I do and I can't live without it! I love this product and I use it so much. It's especially perfect to use before bed because it smells of lavender. It's such a simple product but it works so well at revitalizing tired skin. Travelling always means having to cut down on the number of products you take. That means I always have to cut out products I use in my daily routine and substitute them for something else. In my case that means having to find a product that covers and moisturises my face aka a good tinted moisturiser. I first heard about La Roche Posay on Into The Gloss and then I bought this product of theirs! It's perfect for holidaying because it also has SPF 50. 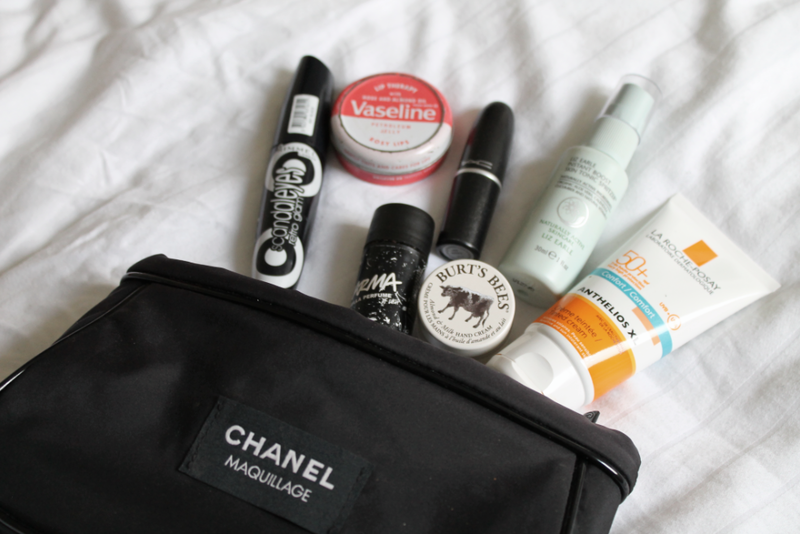 What are you favourite products to take travelling with you? I will have to try the retro scandaleyes mascara! I'd try to have them all for mmy trippppps too! I will consider getting the La Roche Posay tinted moisturiser, I hope it's not too dark! by the way, have fun in Spain! if you like make up, I recommend you to visit a store that you may like, it is called Etnia and I have just recently wrote about it in my blog!